The 2016 Courage in Editorial Cartooning Award from Cartoonists Rights Network International will go to an Iranian refugee cartoonist who goes by the name Eaten Fish, the advocacy group announced on Friday. Eaten Fish is currently held in a refugee detention center run by the Australian government on Manus Island, where he has been subject to “beatings, deprivation of food, and even worse degrading treatment by the guards” in retaliation for documenting the conditions there through his work. Needless to say, that situation in combination with the substandard health care provided in the camps has done nothing to improve Eaten Fish’s mental state. Factors including repeated sexual assaults from guards and other prisoners have triggered his OCD such that he obsessively washes his clothes and scrubs his body raw. His panic attacks are often accompanied by extreme pain and a paralytic state. In the absence of adequate treatment, his continued cartooning may be the only outlet that keeps him barely hanging on, but he says he has also faced reprisals for simply documenting the conditions and his mental state. Earlier this year, Eaten Fish was put in touch with Australian cartoonist Andrew Marlton, AKA First Dog on the Moon. 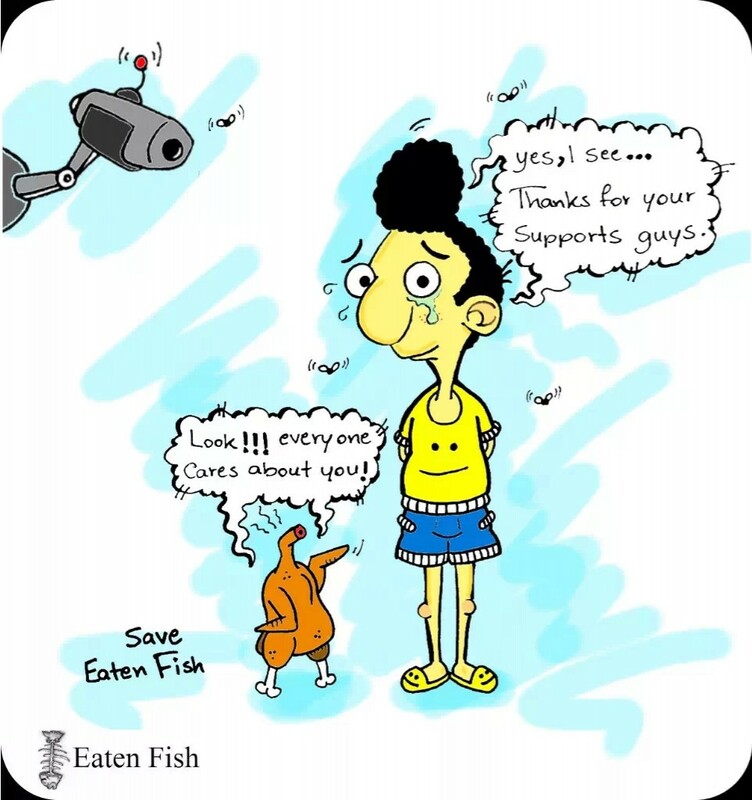 Marlton has set up a website at eatenfish.com to draw attention to his plight and share cartoons of support from colleagues in Australia, including Marlton’s own strip about their online correspondence. Another advocate, writer Janet Galbraith, has set up an online petition urging the Australian government to bring Eaten Fish into the country and provide him with the mental health care he desperately needs. Eaten Fish is one of those who’s [sic] work as a cartoonist brings to light the horrors that are happening around him. CRNI believes that his body of work will be recognized as some of the most important in documenting and communicating the human rights abuses and excruciating agony of daily life in this notorious and illegal prison camp. His work pushes through the veil of secrecy and silence and layers of fences in a way that only a talented artist speaking from the inside can. We hope that this award will help shine a brighter light on the excesses of this camp. His work is addressed to the critical eyes of the world while exposing the xenophobic and racist policies of the Australian government in their dealings with immigrant refugees. Some examples of Eaten Fish’s work, often incorporating his detainee number RUF-115, can be found here. Earlier this month Australian government officials announced that the detention center on Manus Island will be shut down, but also insisted that none of the 854 men currently held there will be allowed into Australia. Their ultimate fate remains unclear.